Just turned 50! I learned at school, when I was about 11 but just recently, about a year ago, learned to read patterns and really took off. Before that, I only made scarves. Don't worry about those weird looks at your school. Think of it as if they are admiring & thinking how nice it would be to learn what you are working on! I'm actually 33 & I enjoy crocheting for the most part. But there are times that I can't get into so I just take a break! 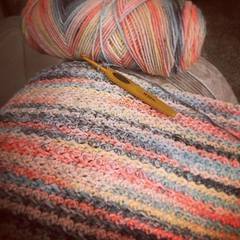 I'm hoping to be able to push through this boredom & keep on crocheting. I turned 32 September 2. I turn 74 this September! And I hope to still be crocheting for many more years! !